Note: I don’t review substandard books. I make time to read a lot, but I don’t have a lot of time to review books, so what I do share, I’m sharing because the book has been very influential and helpful to me in my life, and I believe it will also help others. If you want to become an influencer these are must-reads. Want to give a TEDx talk? Read this first. Tags: Speaking, presenting, TEDx, leadership, charisma, influence. You’re preparing to give a TEDx talk. You’re preparing to give a presentation of any kind. You want to get paid to speak publicly. You want to influence people through your speaking. You’re in sales or marketing. I gave a TEDx talk in 2014. It has been viewed online by over 30,000 people. Do I wish I had been more prepared? Do I wish I had finished my slides a month before, rather than the morning of, at 3 am? Do I wish I had gotten more than 3 hours of sleep? Do I wish I had practiced 50 times before giving my talk, rather than having zero practice? Do I wish I had done better? Do I wish I had read this book 10 times before I gave my talk? Yes, to all the above. Prior to my TEDx talk I read a bunch of books on public speaking, and the handful of those that focused specifically on presenting at a TEDx event, including this one. 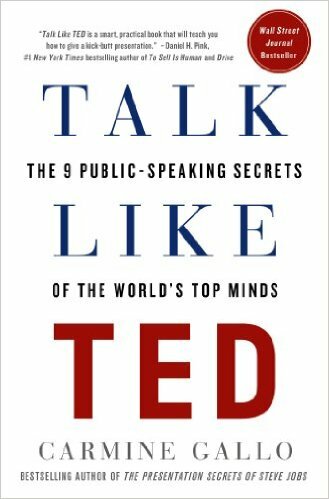 While there are lots of good books on public speaking, when it comes to speaking at a TEDx event, this is the one book you have to read. In the book Gallo shares lessons on how to master the art of storytelling, be passionate about the subject matter, speak conversationally, use humor, etc., but perhaps the most helpful content is when he analyzes TED talks and shows exactly what people have done right and wrong. Not planning on giving a TEDx talk? This book is still helpful if you have any need to speak in front of anyone, whether at church, at school, or in any other sphere.